The U.S. envoy for North Korea will travel to Pyongyang on Feb. 6, 2019 for talks with his North Korean counterpart on this month's planned summit between Donald Trump and Kim Jong-un, the State Department said. 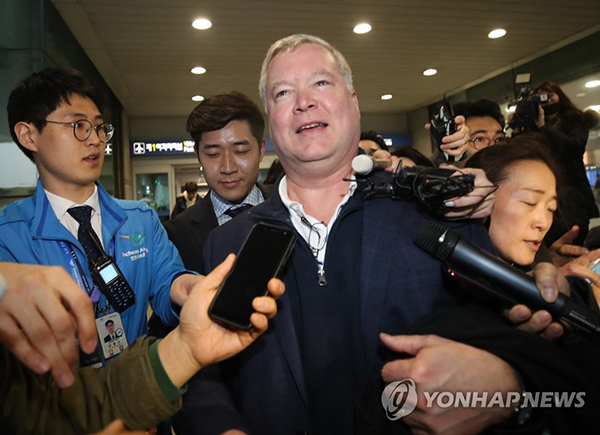 Special Representative Stephen Biegun will visit the North Korean capital from Seoul to meet with his newly appointed counterpart, Kim Hyok-chol, and prepare for the U.S. president's second meeting with the North Korean leader, the department said on Feb. 4, 2019.
his photo shows U.S. Special Representative for North Korea Stephen Biegun surrounded by reporters upon arriving at Seoul's Incheon International Airport on Feb. 3, 2019. The two men will also "advance further progress on the commitments the President and Chairman Kim made in Singapore," it said in a statement, referring to the first summit in June, at which the department noted the two leaders agreed to the goals of complete denuclearization, transformation of bilateral relations and the building of a lasting peace on the Korean Peninsula. Biegun arrived in Seoul on Sunday for talks with South Korean officials ahead of his meeting with Kim, who previously served as North Korea's ambassador to Spain. The two sides are expected to seek a deal on U.S. "corresponding measures" for North Korea's elimination of its nuclear weapons and ballistic missile programs. Biegun made clear in a speech at Stanford University last week that Washington is ready to discuss those measures, although it won't lift sanctions on the regime until denuclearization is complete. He also suggested that Trump is open to declaring an end to the 1950-53 Korean War -- a key North Korean demand -- to remove hostility that has plagued the two nations' relations since the conflict closed in an armistice, not a peace treaty. Trump said earlier that the venue and exact date of the next summit would be announced Tuesday during or shortly before his State of the Union address. Vietnam has been floated as the likely host, with the venue in Hanoi or Da Nang. Biegun last traveled to Pyongyang in October, when he accompanied U.S. Secretary of State Mike Pompeo to a meeting with Kim Jong-un. In his speech last week, he said the North Korean leader had promised to dismantle and destroy all plutonium and uranium enrichment facilities, not just those in the main nuclear complex in Yongbyon, if the U.S. took corresponding steps. The North Koreans added the words "and more" in describing their commitment to dismantling and destroying the nuclear program, according to Biegun. But before denuclearization is complete, the envoy said the U.S. will require a full declaration of the nuclear and missile programs as well as verification of their dismantlement. Despite Kim's repeated commitments to denuclearization -- at his meetings with Trump and South Korean President Moon Jae-in -- skepticism persists about whether North Korea will surrender its nuclear arsenal. Biegun admitted last week that there is no agreed upon definition of denuclearization. In the past, North Korea has said it calls for removing the U.S. nuclear umbrella over South Korea as well as eliminating its own nuclear weapons. Meanwhile, in a congressional hearing last week, U.S. Director of National Intelligence Dan Coats said the North is unlikely to give up its nuclear program because the country's leaders view it as critical to regime survival. Trump responded in an interview with CBS that "there is a good possibility of that" but that "there's also a very good chance that we will make a deal." "I think he's also tired of going through what he's going through," Trump said of the North Korean leader, adding that he likes him and that they get along great. "He has a chance to have North Korea be a tremendous economic behemoth. It has a chance to be one of the great economic countries in the world. He can't do that with nuclear weapons, and he can't do that on the path they're on now," Trump said, alluding to the economic rewards and foreign investment his administration is promising in return for denuclearization. Biegun and Kim Hyok-chol were introduced when the latter accompanied a senior North Korean official to Washington last month to meet with Trump and Pompeo. After the meeting with Trump, the White House announced that the second summit would be held in late February at a location to be announced in the future. Biegun then flew to Sweden for talks with North Korean Vice Foreign Minister Choe Son-hui, who was previously believed to be his counterpart.